Go Hard is a single from D'Saprano's mixtape titled Thoughts of A Stoner. 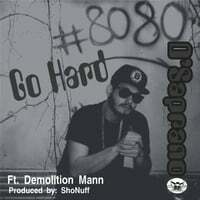 Produced by: ShoNuff Featuring: 80 Proof Ent's own Demolition Mann. This single is off of D'Saprano's Long Awaited Mixtape #TOASv1 Under 80 Proof Entertainment On 4/20 With Features From Pookasso, Kash ON, Demolition Mann, Jayso Vvid, TOX, K.T, DJ Official, A-Star, Peezy, Prince City 203 & J.I Watson. Production From ShoNuff, Soundwave, Big Cheff, Mazik and Plus More!